I wish you a beautiful Wednesday! Here’s the second part of “FILM SONGS”. “Circle of Life” is a song from Disney’s 1994 animated film The Lion King. Composed by Elton John, with lyrics by Tim Rice, the song was performed by Carmen Twillie (the deep female lead vocals) and Lebo M. (opening Zulu vocals) as the film’s opening songIn an interview, Rice said he was amazed at the speed with which John composed: “I gave him the lyrics at the beginning of the session at about two in the afternoon. By half-past three, he’d finished writing and recording a stunning demo.” Elton John sang a pop version (with alternative lyrics) of the song with the London Community Gospel Choir, which was included in the film’s soundtrack and made into a music video. “Circle of Life” was nominated for the Academy Award for Best Song in 1994, along with two other songs from The Lion King: “Hakuna Matata” and “Can You Feel the Love Tonight” which won the award. The song reached No. 11 in the UK and No. 18 in the United States and is featured frequently in attractions based on The Lion King, such as Disney theme parks and parades. Michael Crawford sang it as part of a medley for The Disney Album in 2001. Here’ s the opening scene with Carmen Twillie’s version. And here’ s Sir Elton John. 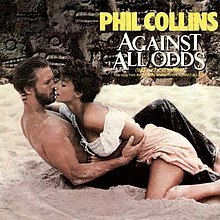 “Against All Odds (Take a Look at Me Now)” (also titled “Against All Odds“) is a song by English drummer, singer and songwriter Phil Collins. It was recorded for the soundtrack to the 1984 film of the same name. It is a power ballad in which its protagonist implores an ex-lover to “take a look at me now”, knowing that reconciliation is “against all odds” while considering it worth trying. The single reached number two in the United Kingdom, while it peaked at number one on the Billboard Hot 100 in the United States, the first of seven US number ones for Collins in his solo career. The song has been covered by several singers, some versions of which have been successful in both the US and UK markets. The song has twice reached number one in the UK singles chart: the pairing of Mariah Carey and boyband Westlife, in September 2000,and then again by Steve Brookstein, the first winner of The X Factor, in January 2005. Now we go back to the 40ies, when film stars also were singers and dancers performing unforgettable songs in their films. “Put the Blame on Mame” is a song by Allan Roberts and Doris Fisher, originally written for the classic film noir Gilda in 1946, in which it was sung by the title character, played by Rita Hayworth with the singing voice of Anita Kert Ellis dubbed in. 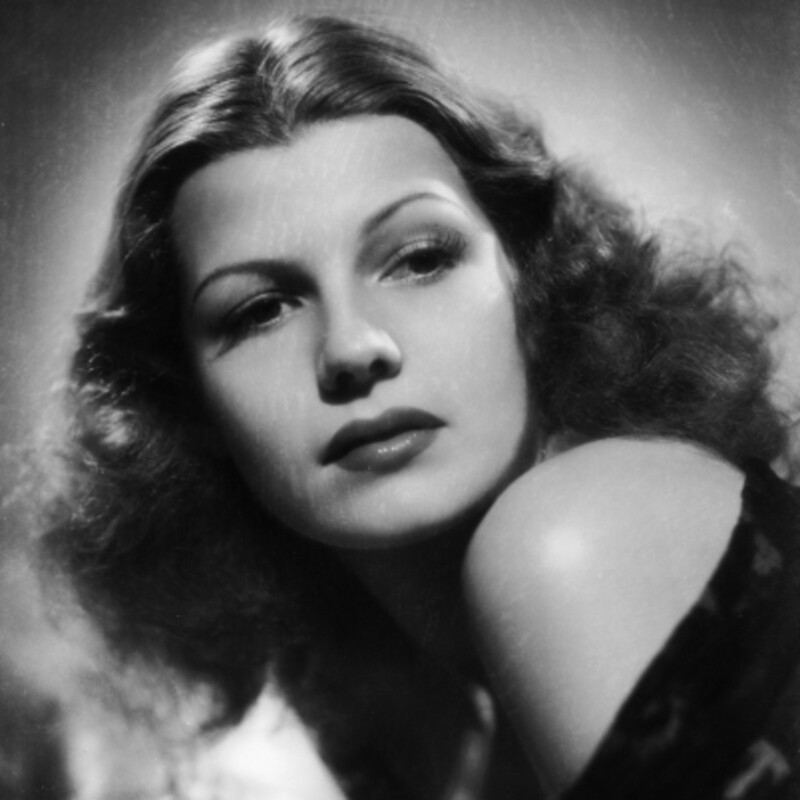 In keeping with the film character Gilda being “the ultimate femme fatale“, the song sung by her in two scenes facetiously credits the amorous activities of a woman named “Mame” as the true cause of three well-known cataclysmic events in American history: The Great Chicago Fire of 1871, the Great Blizzard of 1888 in New York City and the 1906 San Francisco earthquake. Mame is also credited with causing the fictional shooting of Dan McGrew during the Yukon Gold Rush, an event derived from a short narrative poem published in 1907 by Robert W. Service. The song was later reprised as an instrumental version in another quintessential noir film, 1953’s The Big Heat, when Gilda star Glenn Ford first meets Lee Marvin‘s character in a bar. “How Little We Know” is a song written by written by Hoagy Carmichael and Johnny Mercer for the 1944 film To Have and Have Not, where it is performed by the character “Slim” played by Lauren Bacall. 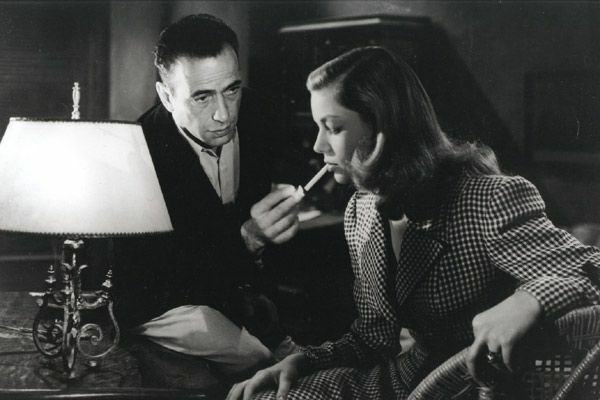 A young Andy Williams recorded the song for the film as a possible alternative track to dub Bacall’s low voice. Bacall said they used her singing. After the film’s release it was a hit recording sung by Judy Johnson. It has been covered periodically, most recently in 1999 by Michael Feinstein with the Maynard Ferguson Big Band for the album Big City Rhythms. River of No Return is a 1954 American Western film directed by Otto Preminger and starring Robert Mitchumand Marilyn Monroe. The screenplay by Frank Fenton is based on a story by Louis Lantz, who borrowed his premise from the 1948 Italian film Bicycle Thieves. It was made in Technicolor and CinemaScope and released by 20th Century Fox. Here’s the title song performed by Marilyn Monroe. “As Time Goes By” is a song written by Herman Hupfeld in 1931. It became most famous in 1942 when part of it was sung by the character Sam (Dooley Wilson) in the movie Casablanca. The song was voted No. 2 on the AFI’s 100 Years…100 Songs special, commemorating the best songs in film (only surpassed by “Over the Rainbow” by Judy Garland). The song has since become the representative song of Warner Bros. (and used as such in the production logos at the beginning of many Warner Bros. films since 1999, as well as the closing logos to most Warner Bros. Television shows since 2003) and was also the title and theme song of the 1990s British romantic comedy series As Time Goes By. The AFI listed it among its “top 100” movie songs. National Public Radio included it in its “NPR 100”, a 1999 list of the most important American musical works of the 20th century as compiled by NPR’s music editors. Back to the 80ies I want to finish my story with a sing from the Cult Film”Mad Max”. 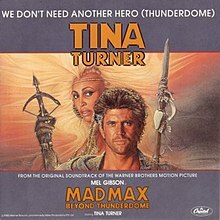 “We Don’t Need Another Hero (Thunderdome)” is a 1985 song by Tina Turner. It appeared in the 1985 film Mad Max Beyond Thunderdome, which starred Turner and Mel Gibson. The song was written by Terry Britten and Graham Lyle. On the heels of Turner’s multiplatinum album Private Dancer, the song was released as a 7″ single, an extended version was released as a 12″ single and on the film’s soundtrack album. In the UK, a shaped picture disc was also released. In 1986, the song received a Golden Globe nomination for Best Original Song and a Grammy nomination for Best Female Pop Vocal Performance. As songwriters, Lyle and Britten received the 1985 Ivor Novello award for Best Song Musically and Lyrically. I wish you a nice day and come back tomorrow with part 3 of this special.